Interstate 185 in Georgia is a 49-mile long freeway that links Columbus and Fort Benning with Interstate 85 at LaGrange. The route doubles as unsigned Georgia 411, with the southernmost ten miles comprising an urban route with six lane sections, and the remainder north across Harris and Troup Counties as a four-lane rural freeway. Lindsey Creek Parkway extends south from I-185 as a freeway into Fort Benning, with three additional interchanges. The route is restricted to military traffic south of U.S. 27-280 & Georgia 520 (Victory Drive). The Georgia State Transportation Board designated 39 miles of I-185, from Exit 12 northward to Interstate 85, as a “Scenic Byway” on October 18, 2007.1 Within Harris County in November 1997, the Georgia Department of Transportation (GDOT) named Interstate 185 as the “Chet Atkins Parkway”, in honor of the legendary country guitarist who lived in the area during his teenage years. 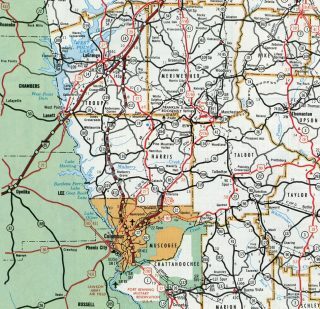 Designated by AASHTO on June 23, 1969, Interstate 185 was constructed between September 1964 and February 1981.6,7 The route was formally extended southward from Georgia 22 to U.S. 27 by AASHTO on December 7, 1984 over what was previously signed as just Georgia 411. The initial portion of what would be come I-185 ran north from U.S. 27 & 280 to Buena Vista Road (former SR 357) by 1969. Interstate 185 overtook the original Lindsey Creek Bypass of Columbus. The freeway was built as a new alignment for Georgia State Route 1, the counterpart of U.S. 27 throughout Georgia. An additional $6.8-million in enhancements at the southern terminus redesigned the directional cloverleaf interchange with aesthetic improvements including four towering monuments, 20 water fountains and twenty 50-foot high flag poles that are illuminated at night. The monuments represent the Infantry and Armor Schools at the Maneuver Center of Excellence located in Fort Benning. Statues adorning the tops of the 50 foot towers include two American eagles, the Follow Me Soldier and the Trooper on the Plains. A ribbon cutting ceremony for the completed project was held at the National Infantry Museum & Soldier Center on October 13, 2011.10 An aerial photograph of the improved interchange graced the cover of the 2013-14 Georgia Official Highway and Transportation Map. The first guide sign for Interstate 85 appears along I-185 north beyond Long Cane Creek. A wide median ensues to the freeway end. Photo taken by Chris Patriarca (04/06/03). One mile south of Interstate 85 is this overhead on Interstate 185 northbound. The city of Atlanta is 55 miles to the northeast while the capital of Alabama is a 95 mile drive to the southwest. Photo taken 09/28/10. Georgia 109 (Greenville Road) spans I-185 one half mile ahead of the separation of traffic for Interstate 85. An empty sign bracket to the left possibly alludes to the unconstructed LaGrange bypass for U.S. 27. Photo taken 09/28/10. Chevrons are painted both over the wide inside shoulder and along the southbound connection for Interstate 85. A stub follows for the unbuilt LaGrange bypass. LaGrange, the seat of Troup County, lies just to the west of I-85 via SR 109. Photo taken 09/28/10. A pair of end shields for Interstate 185 were posted along the ramp to Interstate 85 northbound. These were removed by 2008. Photo taken by Chris Patriarca (04/06/03). Interstate 85 spans Beech Creek ahead of a weigh station on the two mile approach to Exit 21 with Interstate 185 south. Photo taken 12/31/12. A sweeping off-ramp (Exit 21) departs one mile south of the weigh station for the rural drive across southern Troup County to Harris County and Columbus. Photo taken 12/31/12. A third southbound lane opens along I-85 south at the Hines Rover overpass for I-185 (Exit 21). A set of brackets was preposted for the unbuilt ramp to the LaGrange bypass (U.S. 27). 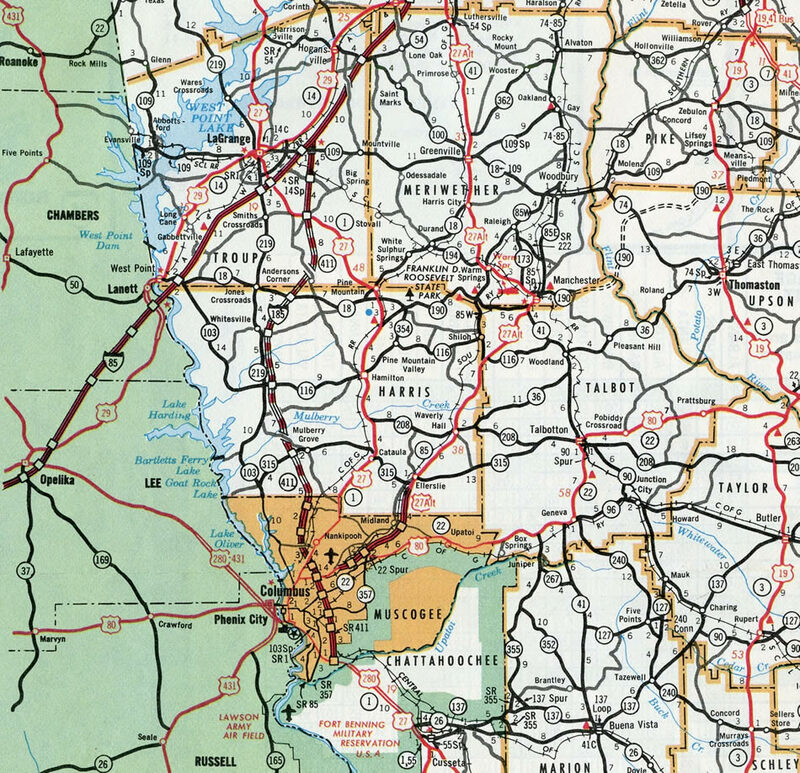 U.S. 27 travels along a four-lane corridor from north of LaGrange to Franklin, Carrollton and Rome. Photo taken 12/31/12. Exit 21 leaves Interstate 85 south for Interstate 185. 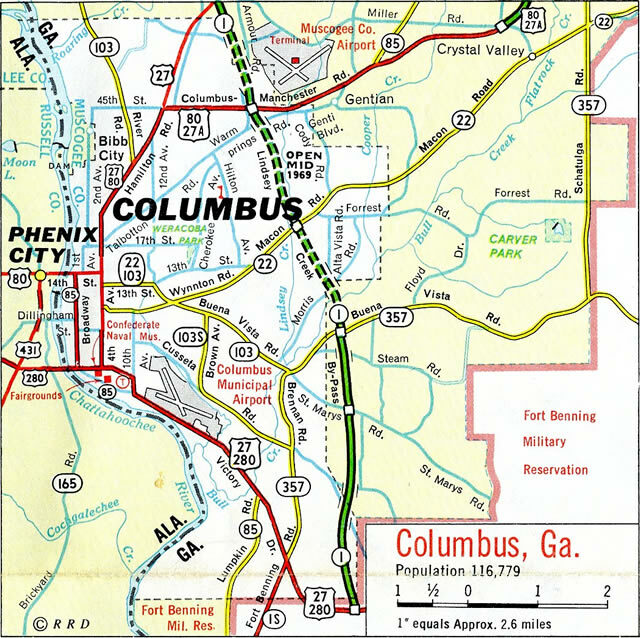 The freeway reaches the Columbus city limits in 35 miles. Photo taken 12/31/12. This guide sign for Exit 5 and I-185 south was replaced during the 1999 statewide exit renumbering project. Photo taken 04/95. The two mile sign for Interstate 185 precedes the diamond interchange (Exit 18) with Georgia 109 on the east side of LaGrange. Photo taken by Chris Patriarca (04/06/03). Exit 18 departs I-85 north, 1.25 miles south of Exit 21 with Interstate 185. The I-185 exit number is derived from the southbound off-ramp. SR 109 otherwise connects La Grange with the Meriwether County seat of Greenville. There is no access to I-185 from the state route. Photo taken 10/04/01. Drivers merging onto I-85 north from SR 109 quickly encounter Interstate 185 south. I-185 serves Phenix City, Alabama via a connection from U.S. 80 (J.R. Allen Parkway), 40 miles to the south. Photo taken by Chris Patriarca (04/06/03). Northbound I-85 reaches the off-ramp (Exit 21) to Interstate 185 south. The freeway leading south to Exit 14 is designated a Scenic Byway as it traverses low rolling hills and Pine Mountain. Photo taken 10/04/01. Cardinal direction based suffixes were still used at the south end of Interstate 185 in 1999. All exit numbers were changed statewide that year, and those such as 1N/S were changed to 1B/A. Photo taken 10/15/99. This ground level sign was posted for the loop ramp (Exit 1A) onto U.S. 27 south & U.S. 280-Georgia 520 east. The aesthetic makeover of the interchange in 2011 removed this sign with a replacement posted further north. Photo taken 08/22/03. A pair of end shields were posted at the U.S. 27-280 & Georgia 520 (Victory Drive) overpass. A new end shield stands just beyond the gore point for Exit 1A. Photo taken 08/22/03. Looking at the second end shield for I-185 formerly posted within the freeway median. Lindsey Creek Parkway extends south to the gate for Fort Benning. Photo taken 08/22/03. A pair of begin shields were posted at the Lindsey Creek Parkway transition to Interstate 185 below Victory Drive. These were removed during work to add the new ramp from GA 520 east to I-185 north. A new assembly now resides where the former loop ramp from Victory Drive eastbound tied into northbound. Photo taken 10/15/99. A new guide sign was installed for U.S. 27 north & U.S. 280-Georgia 280 (Victory Drive) west to Downtown Columbus and Phoenix City by 2003. This sign was relocated slightly further south during the overpass makeover in 2011. Photo taken 08/22/03. Former guide sign posted along U.S. 27 south & 280 (Victory Drive) east, one half mile ahead of the then-cloverleaf interchange with Interstate 185. Photo taken 08/22/03. This sign bridge was removed during work to construct the new ramp for I-185 northbound from Victory Drive eastbound. A span wire supported assembly precedes the two lane ramp departure for both the freeway north and Lindsey Creek Parkway south into Fort Benning. Photo taken 10/15/99. This sign bridge was removed by 2007 as the ramps along the east side of I-185 were extended to Victory Drive. 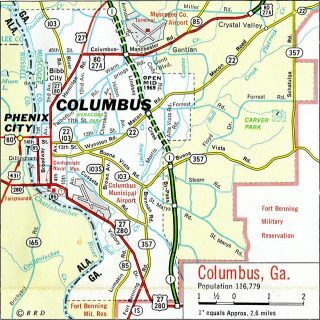 U.S. 27 north & U.S. 280-Georgia 520 west travel as a controlled access route through Fort Benning to reach the city of Columbus. Beyond the ramps for Interstate 185 north and Lindsey Creek Parkway south, the four-lane roadway transitions into a six-lane commercial arterial. Photo taken 08/22/03. “‘Scenic Byway’ created off I-185.” Times-Herald, The (Newnan, GA), October 21, 2007. “Will Bypass Lead LaGrange Down The Right Road? – City Officials Worry About Losing Business To Proposed U.S. 27 Bypass New Highway Would Also Affect Columbus Drivers Using I-85/I-185 Interchange.” Columbus Ledger-Enquirer (GA), September 5, 1999. “City mulls DOT plans.” LaGrange Daily News (GA), February 11, 2007. “How would you like to take I-185 from LaGrange to Florida?.” Times-Herald, The (Newnan, GA), November 30, 2006. “Albany leaders campaign for an interstate highway.” WALB 10 News, November 28, 2006. “Would Four Lanes Drive Away Rural Lifestyle?, Supporters of Widening Georgia 85 Say it would Promote Safety, Business, but some along Road are Skeptical.” Columbus Ledger-Enquirer, September 18, 1994. “I-185 construction : After years, end is in sight.” Ledger-Enquirer (Columbus, GA), June 15, 2011. “DOT Awards $69M in Contracts for I-185 – Columbus and Fortson Firms Win Project Bids.” Ledger-Enquirer (Columbus, GA), June 16, 2007. “Fort Benning completes $6.8 million gateway project; ribbon cutting today.” Ledger-Enquirer (Columbus, GA), October 13, 2011. Page updated November 9, 2015.